Rental cottages, accomodation for 20 persons, activities & celebrations for 40 persons. It is possible to accomodate more people on the neughbouring islands. New timber house, 140m2. Big hut/living room with open fireplace, two big lofts, bedroom, kitchen, shower room and sauna. In the hut there is dining table for 12, two sofas. Possibility to add tables & chairs to dining/meeting tables for 30. The kitchen is fully equipped, and the bedroom and lofts accomodate 8/12 people. Electricity, water, TV, XBox Kinetics, washing machine, dish machine. Read more about the Villa. Timber cottage 50m2. Living room, two bedrooms, kitchen, sauna, big porch. 4 sleep in beds, additional two in sofabed in living room. Electricity, fireplace, water, TV, DVD-player. New timber cottage 25m2 near The Villa. Living room/hut with kitchenette, separate bedroom and sleeping loft. Accomodation for two in bedroom, another two on the loft. Electricity, water carried in, heat storing fireplace, TV. From the large, covered and furnished terrace you can enjoy the great view. 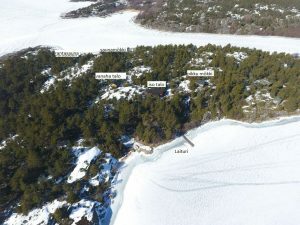 The smaller cottages, The Island cottage and Sauna cottage have no washrooms, but daily sauna times at the Seaside Sauna. New timber cottage 25m2 in own peace on the westside of the island, close to Seaside Sauna. Living room/hut with kitchenette, separate bedroom and sleeping loft. Accomodation for two in bedroom, another two on the loft. Electricity, water carried in, heat storing fireplace, TV. From the large, covered and furnished terrace you can enjoy the astonishing view. The location and views from this sauna are unique and fabulous. You can enjoy the sauna, dip in the sea, and relax in the new hot tub (additional charge). In your disposal we have sauna, washroom, hut/living room with fireplace, dining table for 8, refridgerator, kitchen sink and cooking plate. Cottage bookings include weekly (The Villa, The Cottage) or daily (the Island cottage, The Sauna cottage) sauna times. Additional sauna times are available for the cottage renters, as well as sauna rental without cottage rental. Ask for an offer for the sauna and hot tub! Sailors, travellers – the Seaside Sauna is available for 20€ per hour plus 2€ per person. There are couple of docking places available for the Sauna renters on the eastside marina. Hamnholm is situated in Länsi-Turunmaa (Parainen), Houtskari. It is a small island next to a bigger island Berghamn. Travelling through the beautiful archipelago is an adventure itself, and getting to Hamnholm gives your a possibility for ultimate relaxation in a totally stress-free environment. You can reach the island by your own boat, taxi boat (we have parking places for your cars in Korppoo, Strömma), or by commuter ferry Finnö from Korppoo (harbour Verkan) to Berghamn (100 meters from Hamnholm), from where we transport you to our island. We can also organize a charter boat from Turku on request. The drive from Turku to Korppoo is 78 kilometers, appr. 2 hours. You can take your own car or a bus. We have small boat marina on our island and are building a ferryboat dock for commuter ferries to land for 2013. Please do ask us for the transportation alternatives. Look at the map or click on the Kansalaisen karttapaikka to view the surroundings as well.